Plenty of women over 50 can't be bothered with makeup anymore. I respect that and often ask my self: Why do you bother? For me, the answer is simple: makeup is an important defensive against the effects of sleep deprivation. Like many over 50 women, my sleep habits have been pretty erratic in recent years. Right now, I sleep an average of four hours a night. It's not unusual for me to work a 10-hour day after only two or three hours of sleep. Ugh! I'm working on improving my sleep, believe me. In the meantime, however, makeup adds a little color, brightens up my washed-out appearance, after a lousy night's sleep. Eyeliner has been part of my daily makeup routine since I was 45. A little eyeliner helps to define the eyes and open them up. Now that I'm well into my 50s and experiencing many sleep-challenged nights, eyeliner has become even more important. However, what I use and how I apply it, has changed. I have heeded the advice of the makeup experts. Along the lashes of the upper eyelid to open and lift the eyes. "If the area below your eyes is already dark and puffy, why darken it with eyeliner?" the experts ask. In a soft color. A deep blue or a flowery purple (ie, lavender) brightens the eyes. In a soft pencil or crayon for a softer, smoother look. My go-to eyeliner was a liquid one for many years. The liquid eyeliner created a very thin line that lasted all day. However, when I started drawing the line along my upper eyelid, the liquid liner became problematic. Suddenly, the line was jagged because of my upper eyelid's wrinkles. I started trying different soft pencils and crayons. However, even the more expensive department store products, spread, crumbled and/or melted away during or soon after application. My girlfriend said she likes the Marc Jacob's Highliner, a waterproof gel crayon, because it glides on easily and stays in place for hours. She did warn that the liner had two drawbacks, though. First, it's a bit pricey ($25 at Sephora). And secondly, it's got a thick crayon point, making it difficult, if not impossible, to draw a thin line. My friend said she uses a Q-tip to make the line thinner. I decided to give it a try. I've been using the highliner for almost two months and I'm very satisfied. The product goes on easily and evenly--no jagged line. A smaller tip to create a thin line would be nice. However, it takes two seconds to create a thin line with a Q-tip. If you're frustrated with your current eyeliner, you might want to test the Marc Jacob Highliner next time you're shopping at Sephora. The eyeliner is available in 15 shades. I've been wearing the midnight blue shade. 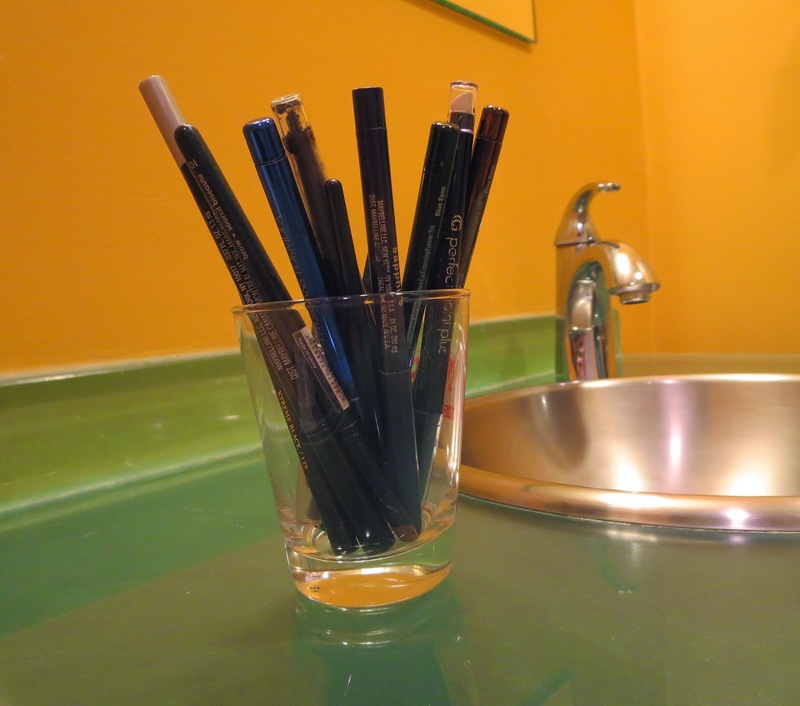 If you already have the perfect eyeliner, leave a comment for Flattering50 readers and me. Thanks! !